Displacement is a basic variable whose value is measured and involved in many other physical parameters such as velocity, force, acceleration, torque and so on. The transducer used for the measurement of displacement can be classified in many ways. One of the most common classification is given below. In order to obtain an electrical output, a mixture of two or more methods is also used. For example, optical methods using photo-detectors present the output as an electrical quantity like voltage, current and so on. Thus, the combined mechanical and optical method is desired. Measurements can be made in the direct and indirect way. In direct method, the displacement is measured directly. But indirect methods are mostly used as the associated variables like force, acceleration, torque, velocity and so on can be obtained. In electrical conversion method, the displacement is converted to an electrical quantity like voltage or current. This value is then recorded or displayed on a screen. A basic displacement scheme is shown in the figure below. Some of the most commonly used methods are listed and explained below. Though some of these methods can be used for the measurement of other physical quantities, the electrical signals derived from such transducers always depend on a displacement parameter. Before explaining about the different photo-electric transducers, it is important to know the basics of photo-electric effect. bright red colored light will not produce a current flow in the metal. But, a dim blue light can cause current flow. Thus, the only way to decide the colors producing the photo-electric effect is through the concept of photons. The idea was brought forward by Albert Einstein, and according to him, light is made up of small packets of energy that had the behavior of particles. These packets of energy were named photons. A red light does not move the electrons, as their individual photons does not have much energy. But a blue light can move electrons as their individual photons have more energy than that of red light. 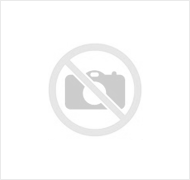 The electrons thus emitted in this manner are called photo electrons. 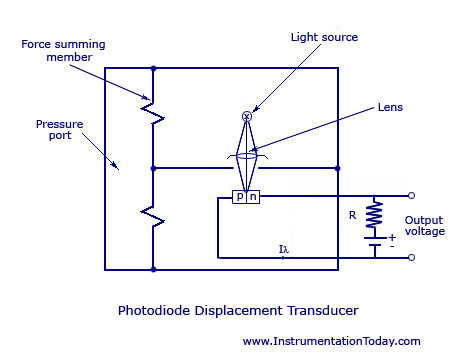 Some of the most commonly used displacement transducers through the application of photo-electric effect are explained below. A schematic of the vacuum photo-tube transducer is shown in the figure below. A displacement produced will modulate or change the intensity of the light intensity of the light incident on the photo-cathode. This changes the amount of voltage and thus, the proportional anode current is given to the resistor R. This changes the output voltage. The output voltage produced will be proportional to the amount of displacement given as input. This transducer is appropriate when there is an availability of a stable light source or an ac modulated light. Can take both static and dynamic measurements. Stability is achieved only for a short period. If the light variations are subjected to high temperatures, there will be very little response. Only suitable for applications having large displacements. The circuit for a photo-diode transducer is shown below. The arrangement is almost same as a photo-tube transducer except that the photo-tube has been replaced by a photo-diode and the lens has been replaced to make the light strike on the junction of the photo-diode. When a displacement is produced, it provides a force on the summing member and thus changes the quantum of light intensity incident on the photo-diode junction. The proportional change in anode voltage produces a current in the resistor R. Thus, an output voltage is produced which will be proportional to the displacement given as input. The circuit is the same as a vacuum photo-tube arrangement except that the photo-conductor is placed instead of a photo-tube. The displacement causes a unique light intensity incident on the photo-conductor and causes a variation in current through resistor R. Hence the output voltage produced will be a linear function of the displacement produced. This device is not used much as the sensitivity produced remains stable only at the beginning and becomes poor at high frequencies. This device has great applications in electronic instrumentation and control circuits as it is an active transducer and needs no associated energy source. According to the light intensity striking on the photo-voltage cell, it illuminates and produces a small proportional voltage. The circuit diagram is the same as that given above except that the photo-tube is replaced by photo-voltaic cell and the source for voltage is taken away. The working is also the same as that explained above and it can be calibrated according to the amount of displacement produced.